Success in business can be measured in happy customers. Aside from your product or service offerings, showing consumers you appreciate them, hear them, and are interested in providing them with the best customer service possible, will not only help you retain current customers but also gain new ones. This, in short, is called good “customer engagement”. Various methods and tools have become available in recent years to best optimize customer engagement. The most recent game changer has come in the form of artificial intelligence. Because AI can provide tremendous benefits with minimal effort, businesses of all sizes, in various fields, are taking full advantage of what it has to offer. In fact, according to a Pegasystems survey on customer engagement, one hundred percent of top-performing companies are currently using AI in some fashion. For those interested in following that lead, we’re outlining ways in which AI can improve customer engagement. Though the general public may not be entirely aware of it, use of AI is already incredibly common. While only thirty-four percent of people think they use AI, the reality is that eighty-four percent of us are interacting with some form of artificial intelligence on a daily basis. This statistic is good news when it comes to placating consumers who fear or negatively view the use of AI in business. Considering the technology can hugely benefit a consumer’s experience, education is key. From better product offers to faster response times and more relevant messaging, AI’s power to anticipate and meet customer needs is a win for us all. Properly engaging with your customers begins with understanding them. Knowing the answer to a few simple questions such as: who they are, what they want, what they can afford, their pain-points, and what platforms they communicate on; gives you a running start to improved connections. Through machine learning and AI technology companies are capable of collecting and analysing enormous amounts of data that can provide the answers to these questions to create better customer experiences with each interaction. An increasingly popular tool for bettering customer engagement is the chatbot. These virtual assistants go hand-in-hand with customer service as more and more companies recognize their value and begin implementing them. 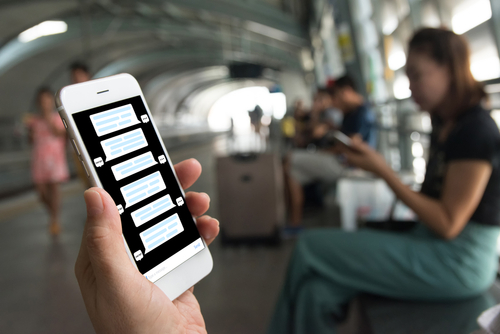 Unlike human customer service representatives, chatbots can work 24/7 and are capable of handling a high volume of requests without the need to spend time searching for answers. This helps reduce service time up to fivefold, improving customer support, and reducing operating costs by as much as sixty six percent. Typically, companies engage with customers passively, responding to inquiries rather than starting them. Chatbots reopen the gates of communication by beginning conversations on their own, and share useful information with customers. Things like new product offers, blog entries and so on. Over time, this leads to greater personalization as Chatbots take in personal information on a customer, and offer them more targeted suggestions. Another aspect of improved customer engagement is hyper-personalization. Consumers today want to feel connected to the brands they buy from and you can meet that request by leveraging AI. Capturing data on prospects is nothing new for businesses, however with AI and machine learning marketers can analyze current and historical facts to perfectly structure the most relevant message to each individual. Knowing what customers are thinking and saying about your brand creates opportunities for engaging those consumers on the topics they’re interested in, while communicating through the platform they prefer. Particularly with a younger audience, positive customer engagement is essential. Well-educated on technology, the younger generations know what businesses are capable of, and because of that, they expect authentic, meaningful, and responsive interactions. AI can help you meet these needs effectively and efficiently resolving complaints and inquiries 24-hours a day. The guest post was written by Sara a.k.a. Digital Diva, Co-founder of Enlightened Digital who you can follow as well on Twitter.